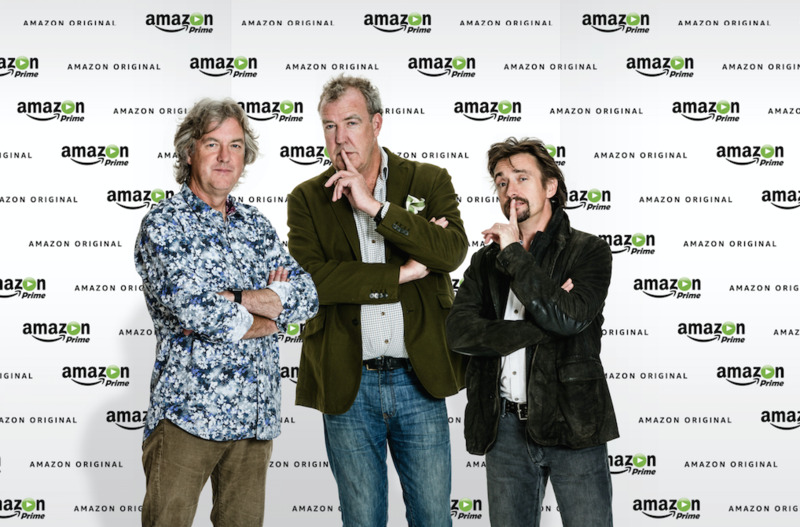 London - 30 July 2015 – Amazon today announced that Jeremy Clarkson, Richard Hammond and James May will reunite to make a new car show available exclusively to Amazon Prime members. The show will be produced by the trio’s long time executive producer Andy Wilman. Clarkson, Hammond and May will join top talent making Amazon Original Series that will premiere on Prime Video in 2015 and early 2016. These include Hand of God starring Ron Perlman (Sons of Anarchy) and Dana Delany (Body of Proof), Red Oaks starring Craig Roberts (Submarine) and Paul Reiser (Mad About You), The Man in the High Castle from Executive Producer of The X-Files Frank Spotnitz and Executive Producer Ridley Scott (Blade Runner), the company’s first docu-series, The New Yorker Presents, as well as second seasons of the multi-Golden Globe-winning comedy Transparent, Mozart in the Jungle starring Gael Garcia Bernal (Rosewater) and Bernadette Peters (Smash), and Bosch, from Michael Connelly and starring Titus Welliver (Lost). For further information / images please contact Hannah Pawlby at freuds on Hannah.Pawlby@freuds.com and +44 7989304422. Amazon Prime offers members the largest selection of any video streaming service in the UK with unlimited access to over 15,000 popular movies and TV episodes – all at no additional cost to their Prime membership. Prime offers members stunning picture clarity with Amazon Original content available in Ultra HD on compatible Sony, Samsung and LG Ultra HD smart TVs. Amazon Prime is also the first video service to offer titles in high dynamic range (HDR). HDR brings greater contrast to the screen with brighter colours, enhanced shadow details and distinct highlights to make images appear vivid, rich and lifelike, more so than ever before. Amazon Prime programming is available on more than 400 devices, including Amazon Fire TV and the newly released Fire TV Stick, Fire tablets, iPad, Android tablets, iPhone, Amazon Fire Phone, Android phones Xbox, PlayStation, Wii and Wii U, and through the web at www.amazon.co.uk/primevideo. In addition to this vast selection of movies and TV shows available at no additional cost to Prime members, all customers can also choose from more than 50,000 popular movies and TV episodes available to digitally rent or buy through Amazon Instant Video. In addition to streaming video, Amazon Prime members enjoy unlimited One-Day Delivery on millions of items, access to one million songs to stream and download through Prime Music, unlimited photo storage in Amazon Cloud Drive and access to 800,000 Kindle books to borrow. Prime members in eligible postcodes in London are now offered one-hour delivery on over ten thousand items through the Prime Now mobile app. Customers who are not already members can start a 30-day free trial of Amazon Prime by visiting www.amazon.co.uk/prime. Amazon.com opened on the World Wide Web in July 1995. The company is guided by four principles: customer obsession rather than competitor focus, passion for invention, commitment to operational excellence, and long-term thinking. Customer reviews, 1-Click shopping, personalised recommendations, Prime, Fulfillment by Amazon, AWS, Kindle Direct Publishing, Kindle, Fire phone, Fire tablets, Fire TV, and Amazon Echo are some of the products and services pioneered by Amazon.